The recent blockbuster movie Bahubali had people discussing a city called Mahishmathi created by graphics. Breathtaking aerial view of an imaginary city, depiction of momentous events with citizens and their Royalty – an inspiring Rajamatha who commands respect, a valiant hero and his equally valiant bride who are deeply loved, a despot who is endured but not loved, and a host of other memorable characters have all caught the imagination of the whole country. This fantasy is loved because it portrays a culture now lost, but still deeply embedded in the nation’s sub conscious. No doubt, the patriots of any country would love anything that extols the greatness of their culture and their ancestors. A colourful culture with deep understanding of Nature, with insightful thoughts about human lives and society for a sustainable fulfilling life, reflected in its architecture, textiles, jewellery, language, music and dance justifiably makes anyone proud and happy. It is the duty of any set of people to preserve these wonderful things for their future generations; but it is quite sad to see the record of the ‘post independence’ generations. Brainwashed by vested interests, the heritage of Bharat was only derided. Nothing was considered worthy of preservation let alone reverence. The colonial hangover was kept alive and fanned across the whole of Bharat by people with agendas of their own. The fate of numerous places across Bharat with illustrious hoary pasts reflects this sad state. Kanchipuram is one such city that has existed for centuries; it has found mention in Perumbanaatrupadai, a Tamil sangam literature composed nearly two thousand years ago and is referred to as ‘ Moodoor’1 in Tamil which means ancient city! 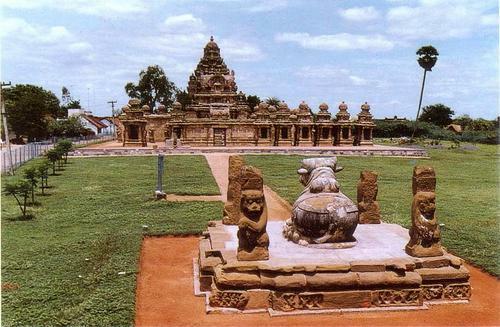 Kanchi had been described as the best of cities in ancient Bharat – ‘ Nagareshu Kanchi ‘ – and its fame was not confined to the south but it was very well known in the north too. Chinese Traveller Hieun Tsang had visited the city in the 7th century and had left vivid descriptions of the city and its people. It had been ruled by visionaries – Mahendra Varma Pallava, Narasimha Varma Pallava; the great Chola rulers such as Raja Raja Chola, Rajendra Chola had their seat at Kanchi and had walked and rode in those streets. The Pallava kingdom had a robust local economy and had trade links with countries beyond our shores; their administration a pioneer in conceiving and executing projects for irrigation turning the lands fertile. Innumerable sculptors, builders of great temples, people with knowledge of engineering and astronomy had lived there. The testimony to their greatness is seen even today in the layout of the city with its broad Raja Veedhis (not widened now, but planned so ages ago) and its various localities laid out with a beautiful temple and a temple tank as a focal point. The city had been a great, well-known centre of learning. Gurus like Ramajunar and Sankarar had resided here in various periods during its long history. Bodhidharma who had taken Dhyan and martial arts to China is said to have lived here. Many great saints – saivite Nayanmars and vashnavite Azhwars have been here. Spiritually, intellectually and materially, the place has seen great heights. Having read about all its greatness, a visitor going to Kanchi today will be appalled at the ‘development’, especially that has happened in the last two decades. The Raja Veedhi would have had stately homes long ago; but can we conjure them up even in our imagination with all the modern shops selling mobile phones, textiles and jewels engulfing us? It is sad that the sanctity of the great soil where innumerable inspiring people had treaded is lost in all the modernity and traffic. Many of the temples that have survived the alien marauders have been senselessly ‘renovated’. There are evangelical institutions en route to ancient temples. A mere walk along those streets with awareness of all its past greatness, had they been reasonably preserved, would have been very inspiring. In the name of eradicating the jaati names, renaming of streets is wrecking havoc with the history of a place. The name ‘ Kammala Road’ merely indicates residences of artisans working with metals. By renaming it as ‘Jawaharlal Nehru Road’ we are eradicating a piece of history from public minds. Gandhi, Nehru and Kamaraj were great leaders but let us not replace old street names with theirs in the ancient cities. A couple of centuries from now, the street where artisans once lived or where weavers lived or traders lived would not be considered communal but informative. If a place with such stature can be treated with scant regard, one needs to ponder on our poor sense of history. The public by their overwhelming encouragement to the movie Bahubali have shown that they love their culture; a little more awareness can bring about more sensitivity about our heritage. Enthusiastic patronage of cricket by Indians generated enormous resources but the revenues never got translated into new facilities to take the game to the masses. Even a small part of the revenues generated from the movie, a trendsetter, used in creating awareness about heritage would be a great tribute for this culture. I am a Chartered Accountant with love for Bharat and its Dharmic heritage, trying to study history not doctored by vested interests, to understand our past so that the future can be handled better. I believe Bharat's problems need to be addressed in several dimensions - spiritual & economic, based firmly on dharma.